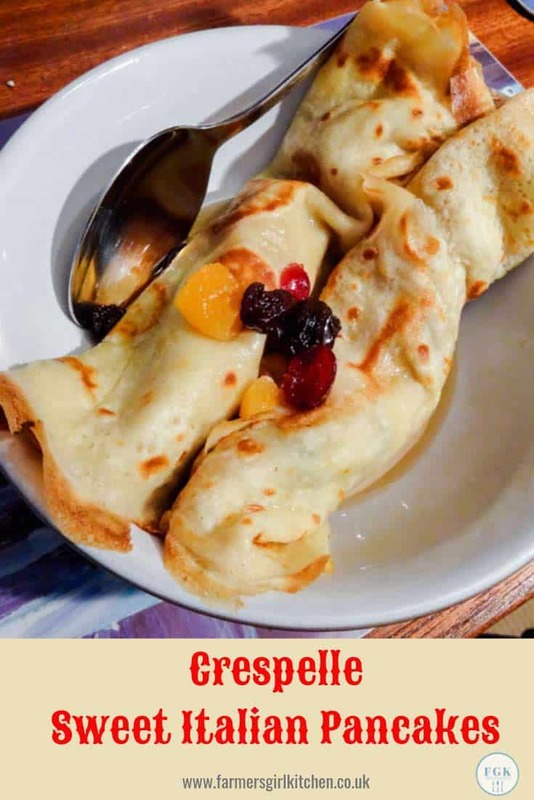 Crespelle Sweet Italian Pancakes are classic crepe-style sweet pancakes which make a really delicious dessert with a filling of dried fruits and a little sweet syrup. Crespelle are really very versatile and can be filled with whatever you have to hand. Spread them with hazelnut spread or peanut butter and jelly for a tasty breakfast or snack. 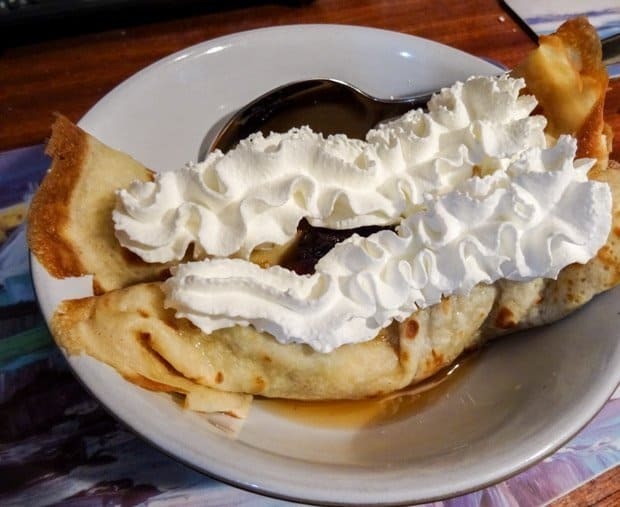 Traditionally, Shrove Tuesday or Mardi Gras (Fat Tuesday) is the day to use up all the rich foods in the house before Ash Wednesday and the start of the fasting season of Lent. 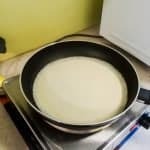 It’s also traditional to make pancakes, whether you take part in Lent or not, pancakes are a simple and delicious base for sweet or savoury toppings, so well worth using this annual reminder to cook some up. 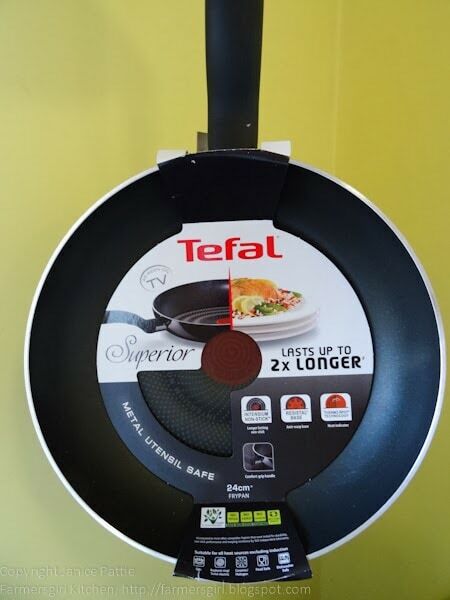 My pancake making was made really easy by the nice people at Tefal who sent me this 24cm ‘Superior’ frying pan. It has Intensium, longer lasting, non-stick, an anti-warp base and the thermo-spot heat indicator that is a feature of Tefal pans. It’s even metal utensil safe, although I didn’t use metal utensils. I’ve been reading this lovely book, Dear Francesca by Mary Contini. 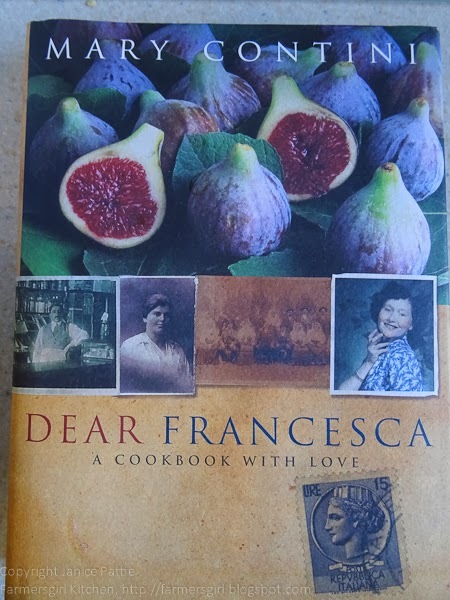 It is a cookery book but full of well-written stories from Mary’s Italian family roots which she has written to pass on to her daughter Francesca. Included in the book is a recipe for Crespelle or pancakes which Mary used to woo Francesca’s father, it’s a fairly standard pancake recipe although a little sweeter than I would usually make. 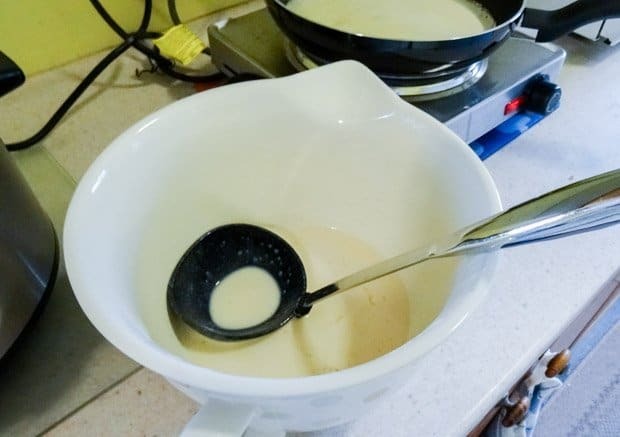 Make the Crespelle batter at least 10 minutes before making the pancakes, it behaves much better if it has had a chance to rest. I made mine a few hours ahead then it was ready for me at dinner time. The pancakes behaved very well in the Tefal pan, flipping over perfectly and cooking evenly with a nice crispy frill around the edge of the pancake. 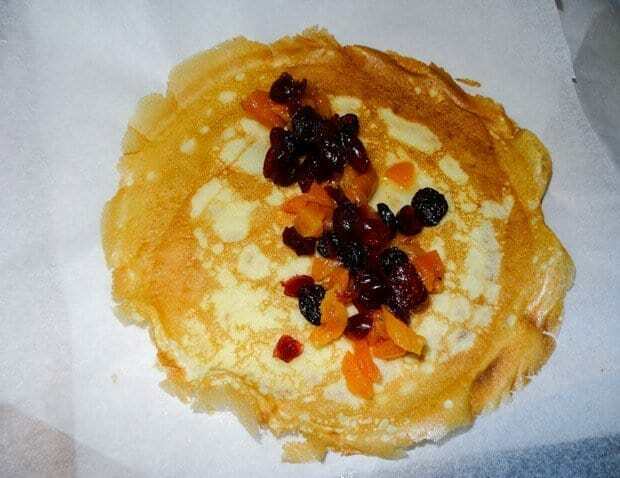 Once cooked lift the pancakes onto kitchen paper and fill with the dried fruit mixture. 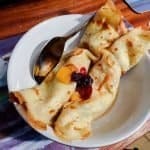 You can fill your Crespelle with any kind of filling or serve in the traditional English way with sugar and a squeeze of lemon. 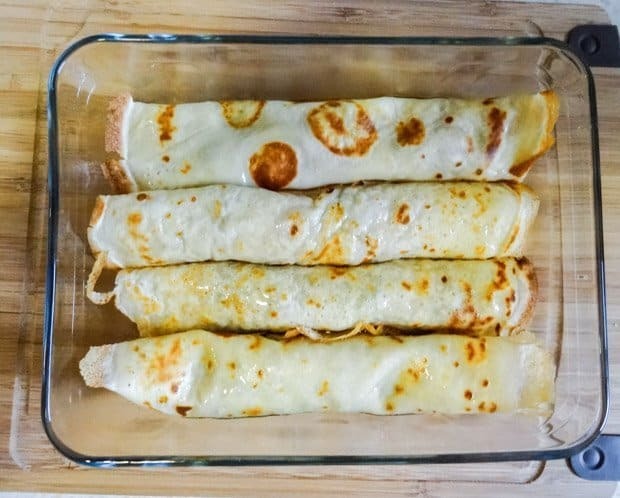 If you are not serving your Crespelle straight away, you can roll them and place in an ovenproof dish ready to gently reheat in a warm oven or microwave. Keep back some of the dried fruit mixture to place on top of the Crespelle and pour over some of the syrup from the dried fruits. If you are feeling really indulgent then you might like to serve the Crespelle with some whipped cream. We used canned whipped cream, but greek yogurt or creme fraiche would also be delicious. 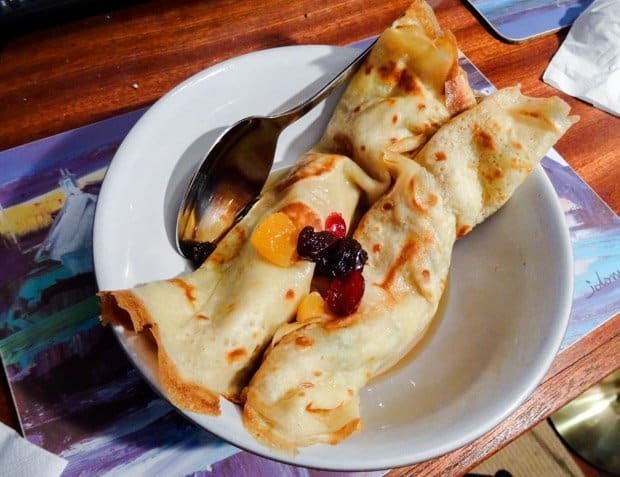 Classic crepe-style sweet pancakes which make a really delicious dessert with a filling of dried fruits and a little sweet syrup. Add the sugar and leave the mixture to rest for at least 10 minutes. You can leave it for several hours or even overnight. 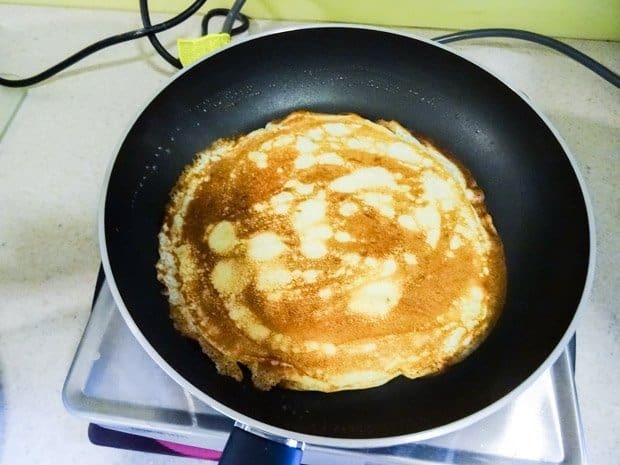 Cook the pancake until it browns underneath (lift it up with a spatula to see) and it should bubble on the top. Then flip it over and cook the other side. As you make the pancakes, layer them between sheets of baking parchment and cover with a clean tea towel until you have all your pancakes and are ready to serve. Chop larger dried fruits like apricots and apple into small pieces, put all the fruits into a bowl with the orange juice. Heat in the microwave for 3 minutes or until hot. Set aside for 10 minutes for the fruit to soak up some of the juice. You can fill the pancakes with all sorts of sweet fillings. Stewed apples, plums or blackberries would be good. Or serve in the traditional English style with a little caster sugar and a squeeze of lemon juice. I’m also adding this to Credit Crunch Munch as this is a cheap, cheerful and filling recipe. CCC is the blog challenge of Fuss Free Flavours and Fab Food 4 All and this month is hosted by My Golden Pear. I was provided with a Tefal Superior Frypan, I was not paid for this post and all opinions are my own. My husband and I have this ongoing 'debate' about pancakes. 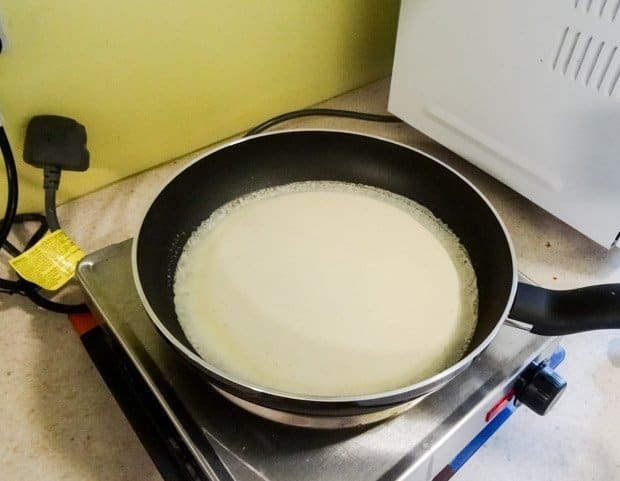 I think pancakes have to have a raising agent while he thinks crepes (without a raising agent) are pancakes. It's always amusing every time I make 'pancakes'! 🙂 These look fantastic and I love the idea of wrapping the pancake around the bacon. Too bad you didn't have any maple syrup! Hopefully your kitchen refurb won't take too long now. Thanks for linking up with #ShopLocal and the #NoWasteFoodChallenge! It's so easy to forget that a few simple basic ingredients can be so versatile and so tasty. I love the idea of adding a curry sauce – it's a new one for me. Thanks so much for taking part in Credit Crunch Munch. It's an aquired taste for breakfast but would be great at other times of the day too. Oh thank you for entering the No Waste Food Challenge – I am a really bad guest host I'm just not keeping up! Not at all, Fiona. It's one of my favourite challenges. Love pancakes of any description and don't make them nearly often enough. Didn't know there was such a thing as Italian pancakes though, so that's interesting to know. I think pancakes are the same everywhere, it's just the language that is different, crepe, crespelle, pancake. For the amount of pancakes I make I think need one of those pans. I use the Tefal pan at home and it is very good. I find myself using less oil in my cooking as the non-stick in their pans are very good. Excellent for pancake making and your winter fruits version looks delicious! Thanks Tina. You are right, you do need less oil or butter. I think you get some kind of pancake everywhere! They all looks droolworthy! I probably should make some pancakes for Shrove Tuesday as well! It is a delightful book, I believe there is another one written for her other daughter Olivia. There's only one remedy for that, Jane! The tefal pans are great, aren't they? I love mine, they make pancakes so easy. Although I have to say we have eaten so many pancakes over the last week, that I am truly getting fed up of them now. I do like your winter fruit pancakes, but maybe in a week or two. I can imagine. I only made these two types and that will probably be it until next year! I definitely have to try the breakfast pancakes, next time I will have some bacon. These look fabulous Janice. I love Tefal pans, I 'd love to get one for pancakes. 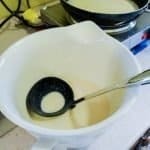 I only have a huge pan which isn't easy to flip when the time comes. 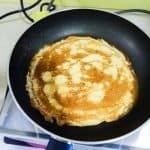 I will try your pancake recipe this week!